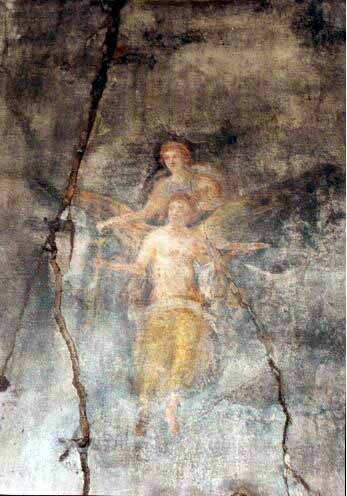 Of the paintings which survive from the Roman classical world, many are frescoes from the area of Campania around Naples. Campania includes Pompeii, Herculaneum, and other towns whose buildings, paintings, and sculptures were preserved by the eruption of Mt. Vesuvius in AD 79. The Romans painted directly on the walls of their rooms, and also on portable panels. In Third and Fourth Style (see below) wall paintings, we can even see imitations of portable paintings - these are paintings of paintings, as it were. Domestic interiors were claustrophobic - windowless and dark - so the Romans used painted decoration to visually open up and lighten their living spaces. Technical elements of Roman painting include the fresco technique; brightly colored backgrounds; division of the wall into multiple rectangular areas (tic-tac-toe design); multi-point perspective; and trompe-l'oeil effects. The art of fresco as practiced in Classical times was described by Vitruvius (De Architectura) and Pliny The Elder (Naturalis Historia.) A wall was prepared by the application of 1-3 coats of mortar (lime and sand) followed by 1-3 coats of lime mixed with finely powdered marble; colored pigments were applied while the wall was still damp. Sometimes tempera and liquid wax were added after the wall had dried. Four "Pompeian" styles of painted wall decoration, which appear throughout Italy and the Roman world, were identified by August Mau (Pompeii, Its Life and Art), in the late nineteenth century. They can be a useful guide to the development of Roman wall painting, provided that one is not too obsessive about them. There is substantial overlap among Mau's styles, and one frequently finds transitional works that combine elements of a preceding style with elements of its successor. Classification by Style properly refers to the decorated wall as a whole. When considering paintings in isolation, as often in museums, the ability to assign a specific Style to a painting depends on three factors: the design of the painting, the date of the painting, and the type of decoration (especially important in distinguishing III/IV Style) which originally surrounded the painting. Examples in museums have unfortunately been removed from their original context. A notable exception is the II Style reconstructed cubiculum of P. Fannius Synistor, from Boscoreale, now in the Metropolitan Museum of New York. A large number of Roman paintings can be viewed in situ at Pompeii and Herculaneum, and also in Archaeological Museum of Naples. First Style ("Incrustation") originated in the early 2d century BC. It is an imitation of marble veneering, in which the painted decoration resembles slabs of colored marble. This style represents the cultural aspirations of an upwardly mobile middle class, and was inspired by the real marble decoration of Hellenistic Greek palace interior walls. Example: Samnite House, Herculaneum. Second Style began in the early 1st century BC. This style opened up the wall by providing an illusion of windows and porticos which looked outward onto imaginary scenes, usually framed by painted columns and architraves. Painted architecture in this style tended towards the heavy and substantial, with multi-point perspective sometimes giving an Escher-like effect. Examples in Style II include the Odyssey paintings from a Roman house on the Esquiline (now in the Vatican), Livia's Villa at Prima Porta (paintings in the Museo Nazionale Romano), the previously-mentioned Villa of Publius Fannius Synistor at Boscoreale, and the Villa of the Mysteries at Pompeii. Third Style ("ornamental") dates from the Augustan period at the end of the first century BC. Abandoning Style II realistic architecture and open vistas, Style III closed up the walls to create a "picture gallery" effect. Typically a large central picture would be flanked by a smaller picture on each side. Architecture becomes attenuated, insubstantial, and fragmentary; elongated candelabrae often replace the earlier painted columns. Fourth Style appears in Pompeii following the earthquake of 62 AD, and continues in the Roman world well into the second century AD. Style IV is heterogeneous, and incorporates elements from all of the earlier styles. Architecture becomes more realistic, and the wall tends to open up again, but not so far as in Style II. Developing from Style III, paintings are given an illusion of portability by being set into trompe-l'oeil aediculae, screens, and tapestries. Further developments include the imitation of stage backgrounds, and an "intricate" style consisting of arabesques on white ground, as in Nero's Domus Aurea in Rome. Figurative subjects in Roman art - other than portraiture - typically refer to myth, legend, and religious ritual. As with their statues, the Romans copied or imitated many of their paintings from Hellenistic Greek originals. Therefore, when looking at Roman paintings, it is important to understand the mythological and religious background of classical Greek and Roman culture. The Romans were literal-minded people, and we should know their stories in order to "read" their art as the Romans did. It will be beneficial to consult a good mythological dictionary, such as Great Figures Of Mythology, by Peter Clayton. There are many reference books on Roman art. One that I have found useful is A Handbook of Roman Art, edited by Martin Henig (Phaidon Press, 1983). The Handbook covers architecture, sculpture, and decorative arts as well as painting, and contains a glossary and bibliography for further reading. For a web-based lecture course on Roman architecture, that includes three introductory lectures on Roman painting, see Prof. Diana E. E. Kleiner's Open Yale Course on Roman Art and Architecture . I welcome notification by email of new and valuable Web sites, as well as comments and other correspondence. William P. Thayer of LacusCurtius, for the site map and advice about image processing. All pages copyright � Michael D. Gunther.